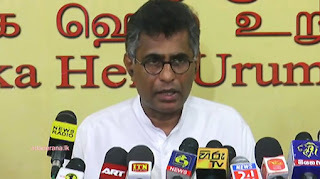 Minister Patali Champika Ranawaka says that the reason the United National Party’s voter base of 5 million reduced to 3.6 million at the recent election was due to “the sin” which is the Central Bank bond scam. Mahendran, during a JHU press conference in Colombo. The Colombo Fort Magistrate’s Court Thursday issued an arrest warrant on the former Governor of the Central Bank of Sri Lanka.